Urge Bill and Melinda Gates NOT to Support KFC in Africa! Request a response to your concerns. Kentucky Fried Chicken (KFC) is spreading through the African continent like the plague with more than 750 locations in sub-Saharan Africa alone. It is commandeering huge industrial chicken farms to supply a growing African middle-class market for KFC products. Soy is a main ingredient in processed chicken feed due to its high protein content. To help small farmers get in on the game, the Bill and Melinda Gates Foundation gave $8 million in 2010 to TechnoServe, a nonprofit partner of Cargill, the world’s largest soy producer and a global poultry corporation. A January 10, 2014 article in Mother Jones – “How Bill Gates Is Helping KFC Take Over Africa -- explains that a primary market for Africa’s soybean growers will be the KFC supply chain. By giving money to TechnoServe, the Gates Foundation is helping to convert small farms and local diets in Africa to a factory-farm economy featuring industrially-raised chickens fed industrially-produced soybeans. Despite a professed commitment to nutrition and ethical investing, in 2012 the Gates Foundation gave nearly a million dollars to Yum Brands, the parent company of Taco Bell, Pizza Hut, and KFC. See The Gates Foundation's Hypocritical Investments. Gates writes enthusiastically: “But what makes them [meat alternatives] really interesting is their taste. Food scientists are now creating meat alternatives that truly taste like — and have the same ‘mouth feel’ — as their nature-made counterparts. . . . Companies like Beyond Meat, Hampton Creek Foods and Lyrical are doing some amazing things. . . .
“I tasted Beyond Meat’s chicken alternative, for example, and honestly couldn’t tell it from real chicken. Beyond Eggs, an egg alternative from Hampton Creek Foods, does away with the high cholesterol content of real eggs. Lyrical has drastically reduced fat in its non-dairy cheeses. . . .
KFC, Burger King, Walmart and other companies the Gates Foundation Trust is supporting fit the definition of EGREGIOUS. These companies mistreat workers. They treat chickens and other animals abominably. They devastate the African and South American rainforests and contribute to exorbitant health care costs, eating disorders and poor nutrition throughout the world. 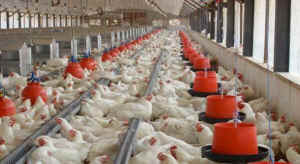 The Gates Foundation should not contribute to the global expansion of industrialized chicken farming. Growing soybeans to be fed to tens of billions of chickens for 7 billion people to eat is vastly more wasteful and environmentally destructive than growing soybeans for people to eat directly in the form of vegan food products. Request a response to your concerns.